Salt depletion is uncommon in chronic kidney disease, other than salt depletion caused by too vigorous use of diuretic drugs, as explained below. Some patients show a tendency to "waste" salt; that is, their kidneys (unlike normal kidneys) continue to excrete salt even when the body content is on the low side. But this defect is not likely to lead to symptomatic salt depletion unless dietary intake of salt is severely restricted and/or diuretic drugs are overused. Hyponatremia (low serum sodium concentration) is much more common in patients with chronic renal failure than is hypernatremia (high serum sodium concentration). Hyponatremia in itself causes no symptoms unless it is severe. When patients drink too much water during their glomerular filtration rate (GFR) determination, they may develop very low serum sodium concentration, accompanied by severe headache and, rarely, by convulsions. 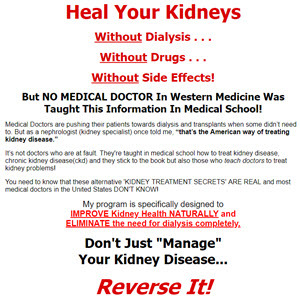 This doesn't usually happen in people with normal or nearly normal kidney function because their bodies can increase their urine flow enough to get rid of the water load rapidly. They can, that is, unless they become nauseated or undergo a lot of pain during attempts at venipuncture. Both pain and nausea are powerful stimuli for the release of antidiuretic hormone, and can prevent the needed increase in urine flow. Hence, even normal people can suffer from hyponatremia during water loading for a GFR measurement, unless they are carefully instructed as to how much they should drink. Occasionally people with chronic kidney disease may continuously drink more water than their kidneys can readily excrete and develop a serum sodium concentration low enough to be concerned about, say 126 mEq per liter or less. (The normal range is from 132 to 148 mEq per liter, but values between 126 and 132, even when maintained for years, don't seem to have any ill effects.) One reason people may drink so much is to relieve the dry mouth that a number of drugs, particularly drugs for hypertension, often produce. Rarely, a patient taking a thiazide diuretic (see below) may develop hyponatremia as a result of a direct action of the drug on the kidney, causing water retention—an action similar to that of vasopressin. At the other extreme, if you lose salt without water for any reason, the concentration of dissolved solids in your body fluids becomes subnormal; thirst is turned off and usually vasopressin is turned off as well. The water content of the body diminishes and the concentration of dissolved solids returns to normal. All of these responses occur more rapidly in a normal subject than they do in a patient with chronic kidney disease, but even in such patients, they eventually result in water and salt balance changing together. Specifically, each 9 grams of salt retained (or lost) is accompanied by 1 liter (1 kg or 2.2 lb) of water. This is why measurement of the serum sodium concentration doesn't tell you anything about the amount of salt in the body; it measures something quite different, namely, the ratio of dissolved solids to water.